One of the key components of health is adequate intake of water. Water is your body’s principal component and makes up about 60 percent of your body weight. Every system in your body depends on water – to flush toxins out of vital organs, carry nutrients to your cells, provide a moist environment for your tissues, and keep your bowels regular. How much water do you need to drink? The 8 glass per day rule likely comes from an estimate of the amount of water the average size body needs to function in 24 hours. However, we are all different and the amount of water we need depends on many factors including our weight, activity level, and outside temperature. Another rule of thumb is to divide your body weight by 2 (a 120 lb person should drink 60 ounce of water). Or just to pay attention to your body. Drink when you are thirsty and watch the color of your urine, which when well hydrated should be light yellow. Many people mistakenly hydrate themselves with sodas, bottled teas, various brands of “vitamin water” and energy drinks. These drinks are filled with a variety of chemicals such as sugar or artificial sweeteners, phosphoric acid, caramel color, synthetic vitamins, and “natural flavors” which are anything but natural. So what should you drink instead? Filtered water is always the best choice. 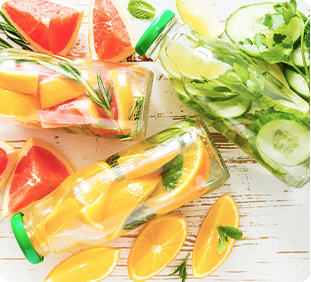 But if you are looking for something with more flavor, you can purchase an infusion bottle to make naturally sweetened beverages. Simply add herbs, fruit, and/or veggies to the basket then add water into the bottle. If you need a little sweetness, add a little honey or raw sugar. Add the following combinations to the infusion basket in your infusion bottle. Then add water, carbonated water, coconut water, carbonated water, or unsweetened tea. For better flavor, let sit in fridge for 12 hours before drinking.